Earlier this year five Alpha Imaging Collective members joined the five winners of the Be Alpha Challenge for a special #BeAlphaHawaii trip. Hawaii invokes an image of endless beaches and azure seas, but this trip wasn’t about sitting on the sand. The group had the opportunity to shoot in on and under the water, nighttime astroscapes under stunning dark skies, and they had a chance to trek to unique spots in and around Volcanoes National Park to get an up-close look at volcanic activity as it was happening. Packing for a trip like this required planning and forethought. You can’t just toss a camera and an all-in-one zoom into a bag and expect to get the best from so many diverse photo opps. We talked to Scott Kranz (@scott_kranz), one of the Alpha Collective members on the trip, to learn more about the Sony cameras and lenses he used on this epic Hawaiian photography excursion. Sony α7R III: I own several cameras, but my go-to body is the Sony α7R III. Although compact and lightweight, it’s also a powerful, pro-grade full-frame setup with a 42-megapixel rating. Whether I’m tackling a commercial shoot or on personal travel, this camera has worked exceptionally well for me. Also, I work in pretty harsh environments and in Hawaii I knew it would get plenty of exposure, so the camera’s weather sealing is critical. The photo below taken with the α7R III shows the sunset’s colors and clouds as seen from Kauai’s southern shore, near the small town of Waimea. 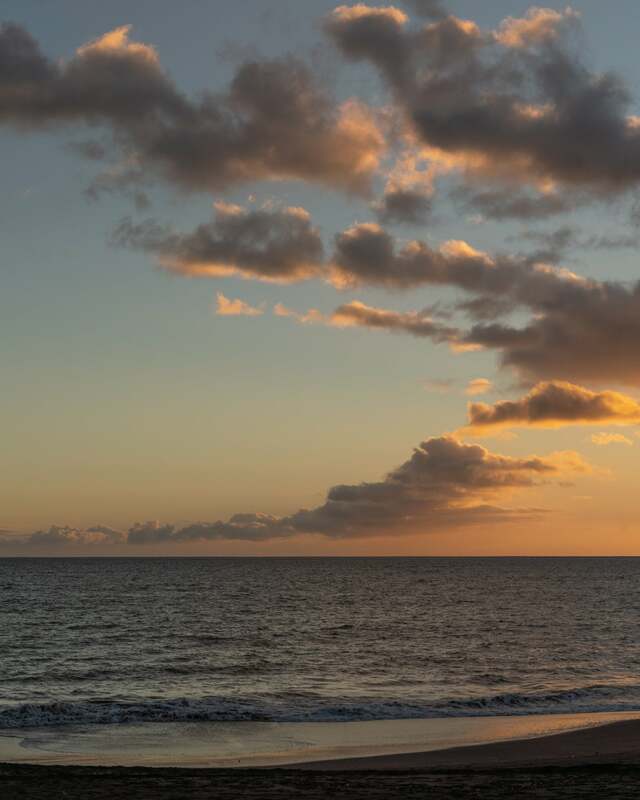 It’s no secret that Hawaii is known for spectacular sunset scenes. Sony α9: For this Hawaii trip, I was fortunate to test out the Sony α9. Although I’ve used the α7R III as my main setup, the Sony α9 was a great second shooter for action scenes. 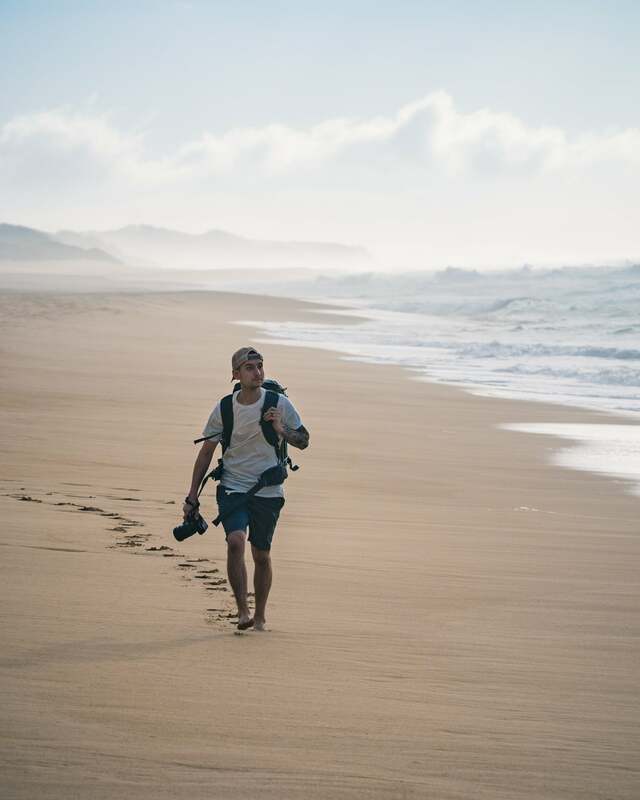 In this photo I captured photographer and Be Alpha Challenge winner Dylan Spitz (@dylanspitz) scouting the long stretch of beach along Kauai’s southwestern shoreline. As storms came and went, we were constantly keeping an eye out for beautiful light and the occasional surprise rainbow. Sony 16-35mm f/2.8 G Master Lens: This wide-angle lens is one of my two go-to lenses. Being a G Master lens, it’s both fast and impeccably sharp. It was the perfect lens for wider landscapes on the island of Kauai, but I was even more excited to use it with my α7R III in an AquaTech underwater housing. Submerging this setup in the warm waters off the Kauai coast, I was able to capture scenes of fish and sea turtles in their natural environment. The wide-angle focal length was crucial – I captured most of my underwater images between 16mm and 30mm. 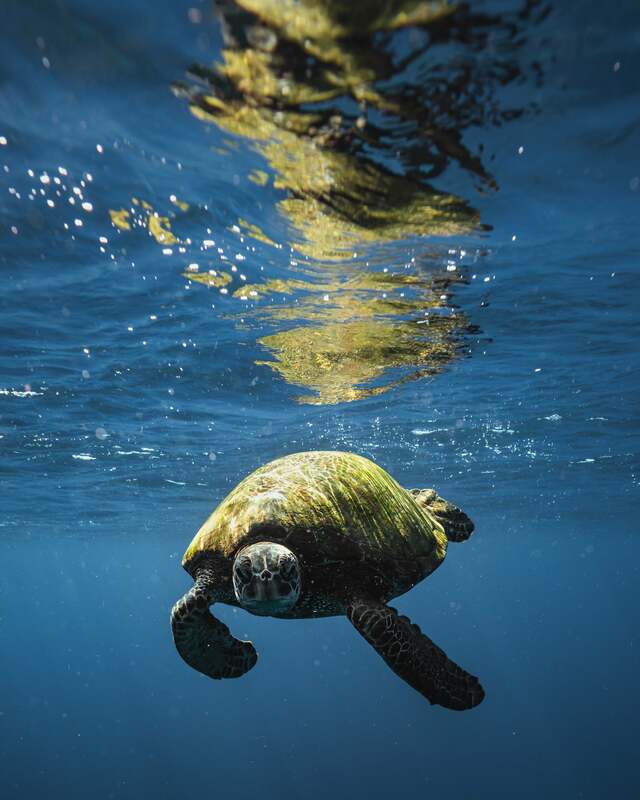 Below is a photo of a local sea turtle floating below the water surface and giving me a good long glance, as I took the beautiful creature’s portrait. Snorkeling and underwater shooting off of Kauai was an amazing highlight of the trip! Sony 70-200mm f/2.8 G Master Lens: This telephoto zoom is my second go-to lens. After switching from Canon to Sony, I initially used a Canon 70-300mm lens (with an adapter) as my telephoto option. I originally believed this option was sufficient. But now that I’ve switched to a Sony 70-200mm f/2.8 G Master Lens, I see the image quality and clarity I was missing by using the Canon with an adapter. There’s no turning back now! The 70-200mm G Master lens is amazingly sharp throughout the frame (all the way to the corners). This zoom lens allows me to compose images of small sections of the horizon, as well as tighter, more intimate details. 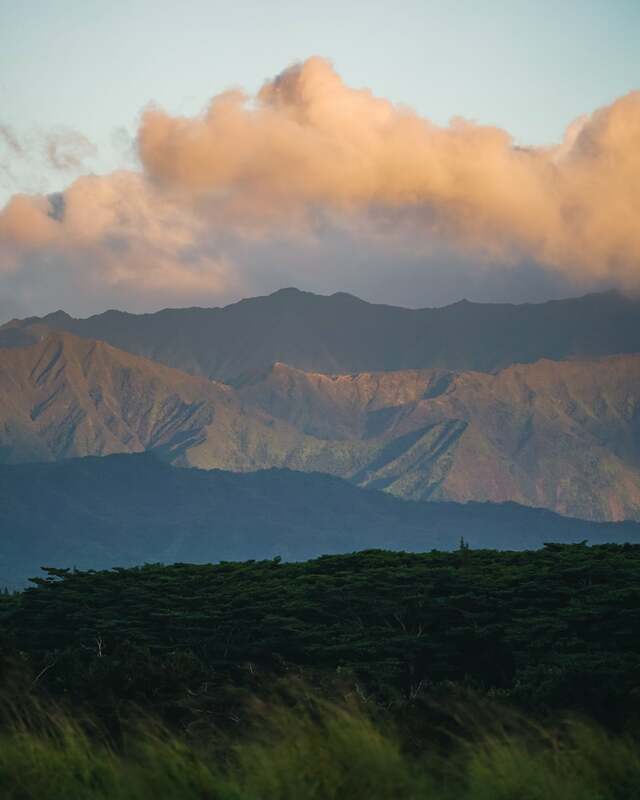 The photo below was from sunrise during our UTV tour and photo excursion where the light painted the iconic ridgelines of central Kauai. Sony SD Memory Cards: I use a variety of SD memory cards, ranging from 32GB to 128GB, and generally keep two cards in my α7R III’s dual slots. I carry all other cards in a small pelican case about the size of a wallet. 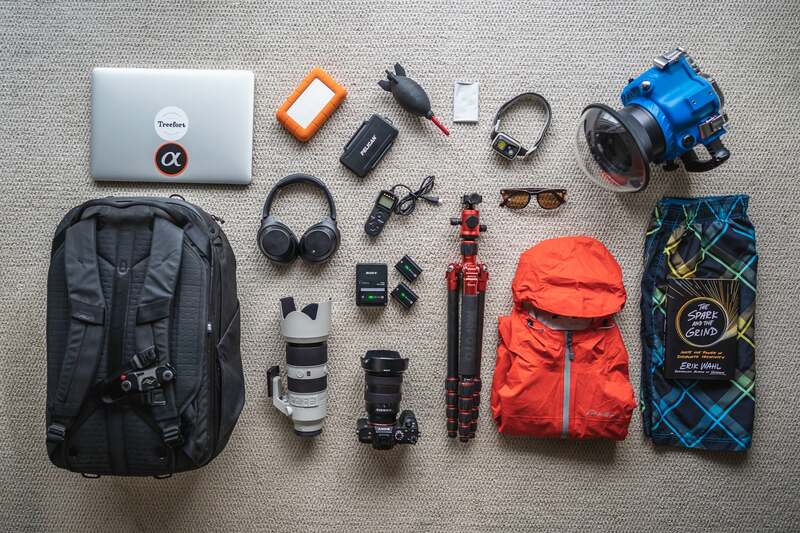 Travel Pack: I use the Peak Design Travel Backpack with a medium-sized camera cube and tech pouch. This pack is versatile, comfortable, and manages to carry all of my camera gear and other devices for most trips. Capture PRO Clip: I also have a Peak Design Capture PRO clip attached to my backpack strap. The clip allows me to hang my camera setup and go hands free when I need to! Water housing: For this trip, I used the AquaTech Elite Water Housing with a Dome Port, along with my Sony α7R III body and 16-35mm f/2.8 lens. I definitely plan to shoot more underwater imagery in the years to come. Tripod: Although I love to shoot handheld, it’s inevitable to need stabilization, especially shooting at night or for long exposures For this trip, I brought my MeFOTO Globetrotter Carbon Fiber tripod. Remote/Intervalometer: Whenever I travel and plan to shoot, I always bring a remote and intervalometer, just in case I plan to shoot a timelapse or otherwise need to trigger the shutter remotely! Microfiber Cloth & Air Blower: My standard on-the-go cleaning tools for my Sony cameras and lenses. Thankfully with the sealed buttons and dials on the α7R III, I need to use these tools less and less, but they’re always good to have. Extra Batteries: Although I can generally go a full day shooting my α7R III on a single battery, it’s always a good idea to bring extra batteries. For this trip, I brought along 3-4 extra batteries (the same Sony Z-seies battery is used in both the α7R III and α9), along with my charger. Wireless Headphones: For any sort of travel, especially long flights to the Hawaiian Islands, I use the Sony wireless noise-canceling headphones (WH-1000XM3 if you’re interested in the exact model). MacBook Pro: While my Seattle office is home to my iMac, I bring my MacBook Pro on my travel to edit on the go. Capturing larger RAW files, I generally import files onto a Lacie external hard drive. Swimsuit: When in Hawaii … you never know when you’ll want to take a dip in a natural pool below a waterfall or at the beach. Rain Shell: If you don’t think it rains in Hawaii, you’re kidding yourself! Kauai has one of the rainiest places on Earth. I brought my Eddie Bauer rain shell and kept it in my bag for all outings. Headlamp: An essential piece of gear if you plan to shoot any early morning or late evening missions. On this trip, I brought a Black Diamond Spot Headlamp with a maximum light output of 200 lumens. Sunglasses & Sunscreen: Another two essentials while in Hawaii, especially for a fair-skinned Minnesota native like myself. Reading: Wanting to cut down my screen time, I’m making a point to bring a physical book on my travels. On this trip, I was engrossed in The Spark and the Grind by Erik Wahl, the inspiring artist and creative who presented at Sony Kando Trip 2.0 in 2018. Scott Kranz is a member of the Sony Alpha Imaging Collective. Follow all of their adventures on Instagram https://www.instagram.com/scott_kranz/.